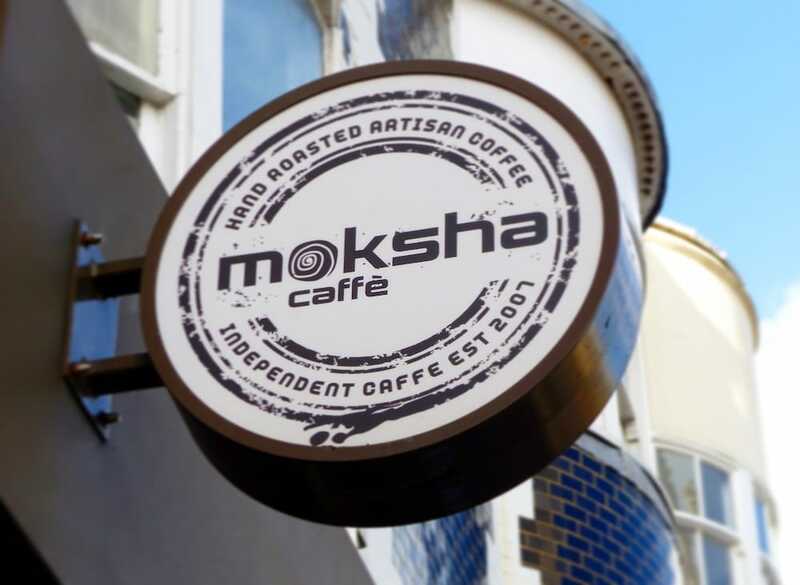 Central Brighton is home to many cafes and spots for lunch, and high on the list has to be Moksha Caffe: an independent food-led café and restaurant, serving up ethically-sourced and delicious breakfasts, lunches and sweet treats. Moksha (meaning liberation and release) has grown from humble coffee shop to fully-functioning kitchen with a modern menu to match. Seasonal soups, hand-crafted burgers, high-stacked pancakes and the full Moksha breakfast, are only some of the fresh and tasty dishes featured. Open for just over 10 years, Moksha is truly a family affair, led by chef-turned-restaurant-owner Oliver de Trafford. It’s loved by locals and little ones, with a kiddie menu and colouring pages to keep them amused (look out for photos on the walls of the Moksha family’s Leo sipping a babyccino!) For a Monday lunchtime, we’re amazed at how busy it is. Between businesspeople meeting over coffee, couples sharing cake and families diving into Moksha breakfasts – it’s hard to spot an empty seat! 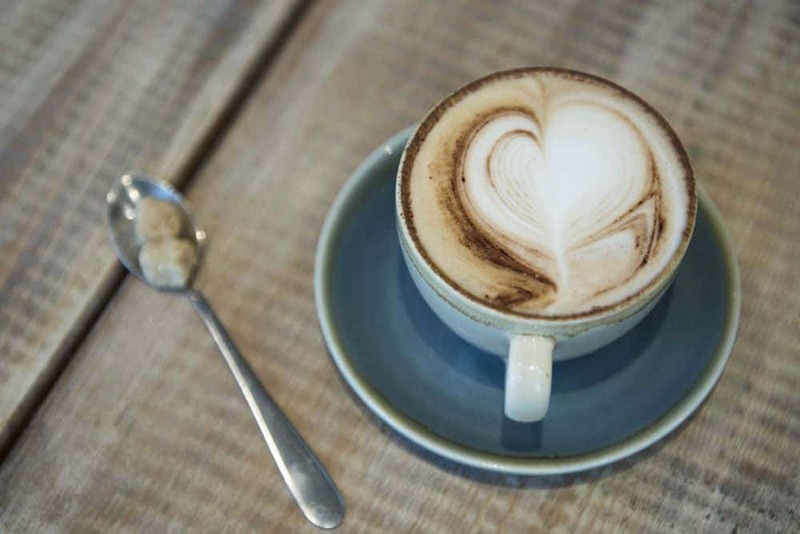 Keen to try Moksha’s own artisan coffee blend, sourced and roasted locally in Littlehampton, we go a little bigger than a babyccino and start with the Moksha mocha and homemade masala chai. 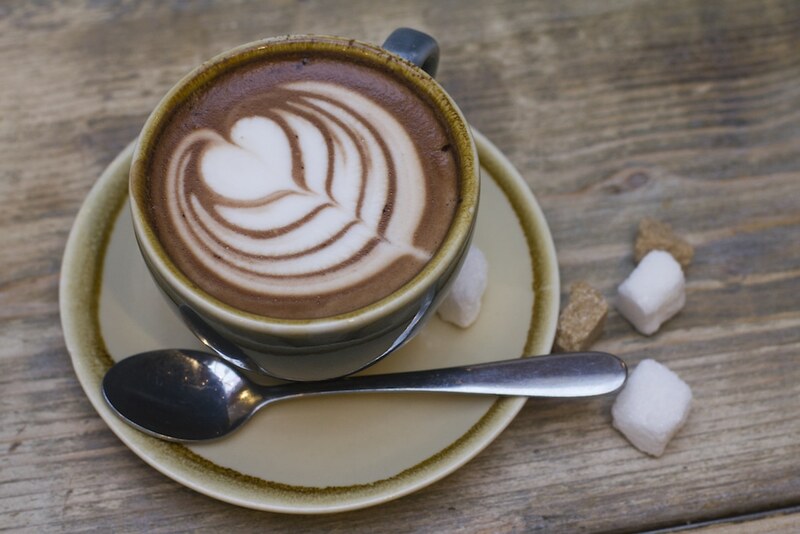 Moksha serve their coffee – hot and iced, with a range of milks to cater for all including organic soya, oat, coconut and almond milk. 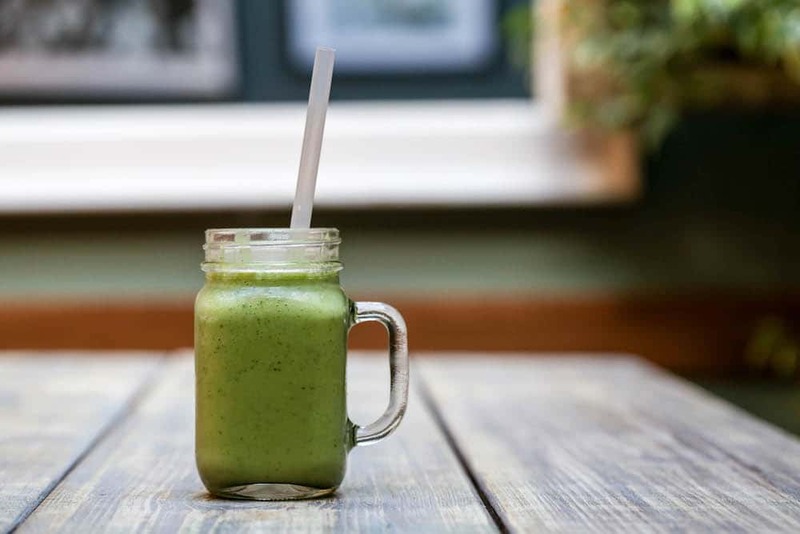 Their drinks menu also features frappe milkshakes, smoothies and cocktails featuring local Brighton gin! A cheap and cheerful cup of coffee can sometimes hit the spot, but there is no denying the depth and distinctive quality of Moksha’s own. The mocha shows off an expertly balanced blend and is just the thing to warm up with on these chilly November days. I’m partial to masala chai, often making it at home and yet even on my best day, Moksha puts mine to shame – a frothy, deeply spiced drink, perfect for the festive season. A glance at the menu and it’s clear that this food-focussed cafe places great importance on where their food comes from. In 2013, the expansion to a fully-fledged kitchen meant the opportunity to ethically source their produce. This care translates into a menu featuring free-range eggs, organic milk in all coffees and free-range meat supplied by a local butcher. So not only does the food taste delicious, but diners can know where it comes from. With that in mind, I order the huevos benedictos from the brunch menu – a Mexican-inspired take on eggs benedict, and from the lunch menu, Mum orders the Monterey Jack burger and fries. It’s not often that you can be bowled over by brunch – I certainly have had my fair share of average sarnies and mediocre eggs. But the huevos benedictos is quite possibly the best brunch I’ve had. 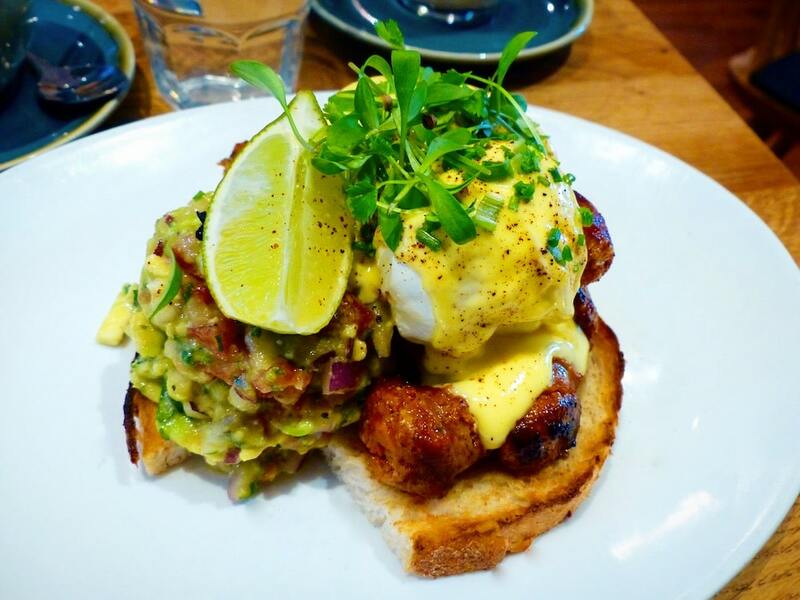 Arriving quickly was a vibrant plate of thick-cut sourdough heaped with free-range chorizo sausages, topped with perfectly poached free-range eggs, zingy chipotle hollandaise and a fresh tomato and avocado salsa – (with a fresh lime wedge which I happily squeezed everywhere!). Another dish of golden, crispy hash browns arrived as a side to our lunch and there was nothing left to do other than tuck in. 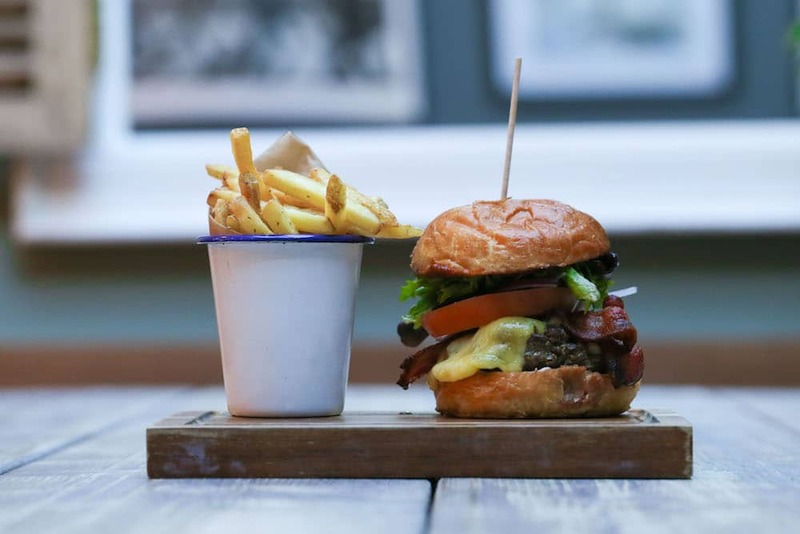 Mum’s burger was a mouth-watering sight – free-range 14-21 day mature beef, Monterey Jack cheese, balsamic onions, tomato, iceberg lettuce, mayonnaise and homemade chipotle BBQ sauce alongside a generous bowl of hand-cut fries. I couldn’t help but steal a little, and the depth of flavour in the beef alone spoke volumes – this is a hand-crafted burger of quality. 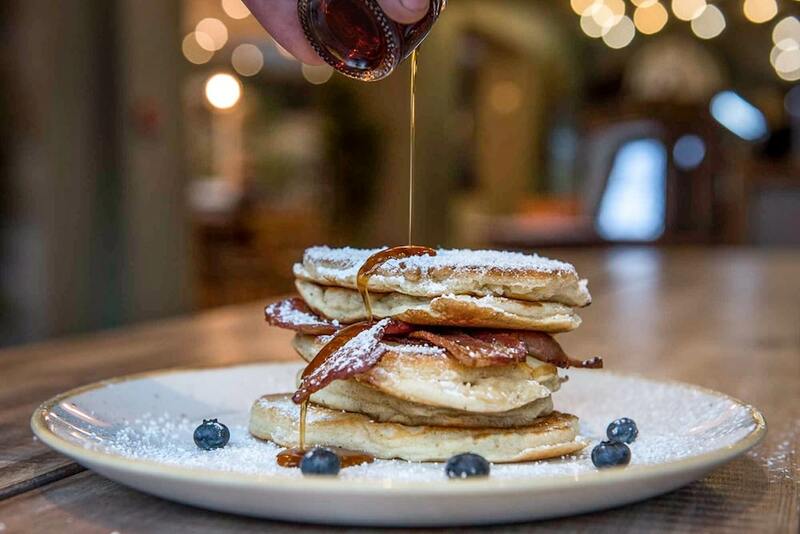 Our future visits must surely include the Brighton Blue burger (with award-winning Brighton blue cheese and smoked free-range Sussex bacon) or going sweet with American-style blueberry or banana pancakes topped with homemade salted caramel sauce. Speaking of, we’re suggested something sweet to round off our lunch. 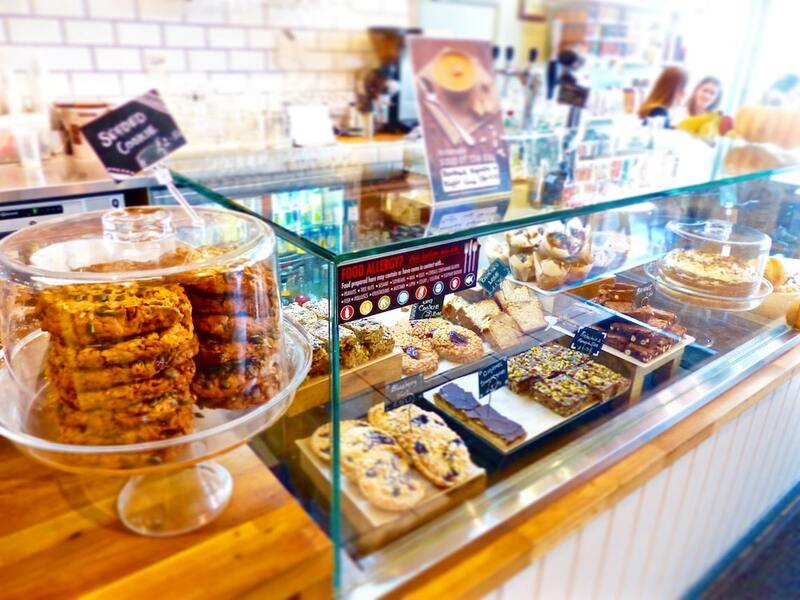 We couldn’t leave without trying one of Moksha’s cakes, and from banana loaves, seeded cookies to dark chocolate and pistachio slices, we were spoilt for choice. 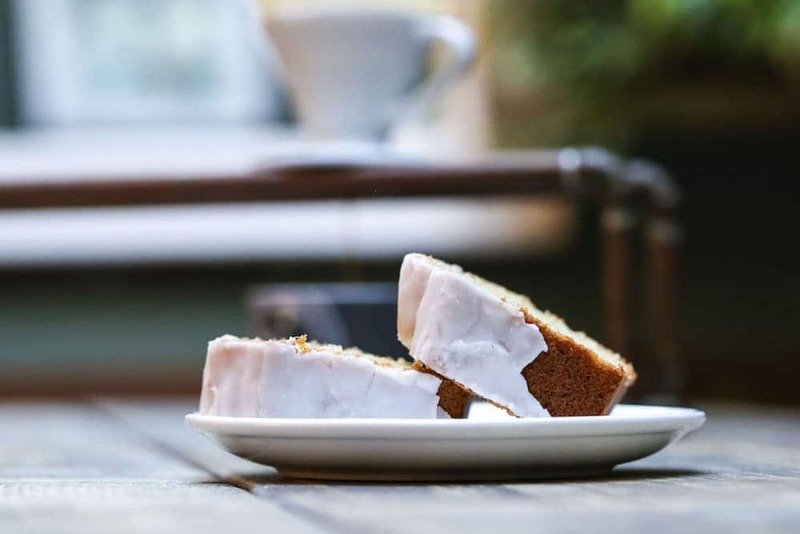 Fancying something light and citrussy, we shared a slice of the orange and almond cake – a light and crumbly sponge, vibrant with fresh orange zest and flaked almonds on top. The family spirit doesn’t just live in the kitchen, but also in the warm and genuine service. 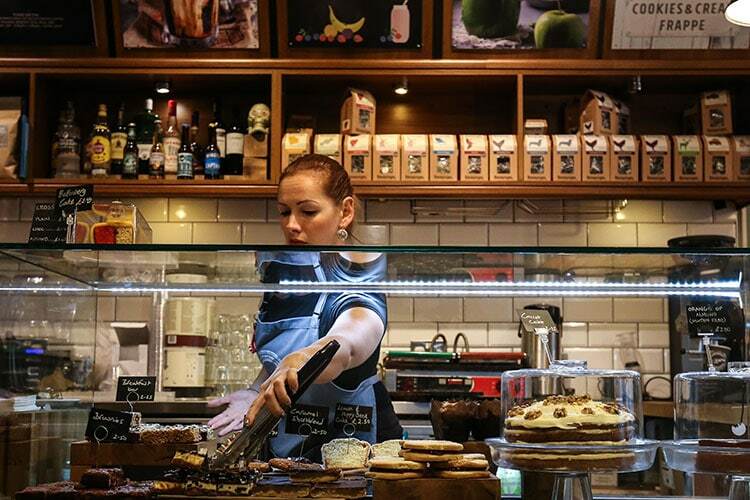 Baristas and waiting staff dealt admirably with busy periods, were knowledgeable about allergens and kept us topped up with water – all without the need to ask. Every element of Moksha oozes high quality and care – from the service, ethical efforts, to the detail in fries accompanying a burger (hand-cut and seasoned with rosemary, no less). It’s five stars from me. Moksha Caffe casts an all-encompassing net and reels everyone in for high-quality, fresh food and friendly, genuine service. Whether for a coffee break, brunch with friends or an excuse to tuck into maple-syrup pancakes, this is a café and worth visiting over and over.